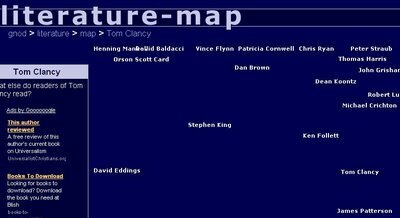 Literature Maps creates a visual display of the literary distance between authors. 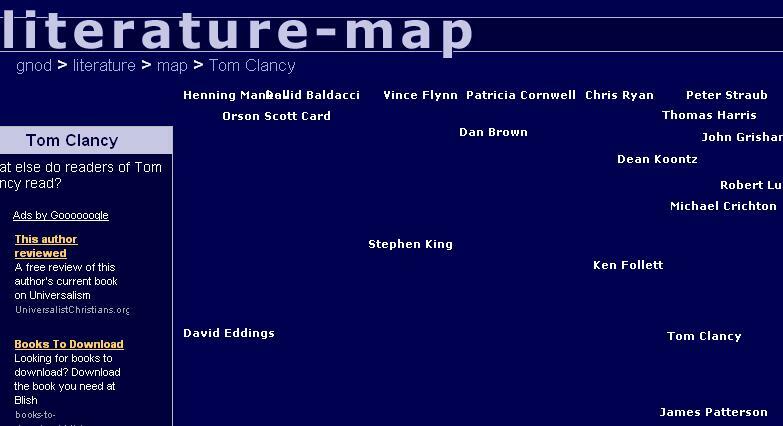 So, say you want to see what authors are close to Tom Clancy. You type his name in, and something that resembles a tag cloud except with author names starts to unravel. The display is dynamic so if you look closely you'll see that the initial author distances are always changing; sometimes moving closer to the central author and sometimes moving away. my experiment in the field of artificial intelligence. Its a self-adapting system, living on this server and 'talking' to everyone who comes along. Gnods intention is to learn about the outer world and to learn 'understanding' its visitors. This enables gnod to share all its wisdom with you in an intuitive and efficient way. You might call it a search-engine to find things you don't know about. It looks like the site might be operated out of Germany given the German language version of the site. The self-adapting nature of the underlying software explains why the author distances are constantly in flux. Presumably, other users are contributing their own preferences as you're viewing the Literature Map, and the software is re-weighting the strength of the author ties dynamically.